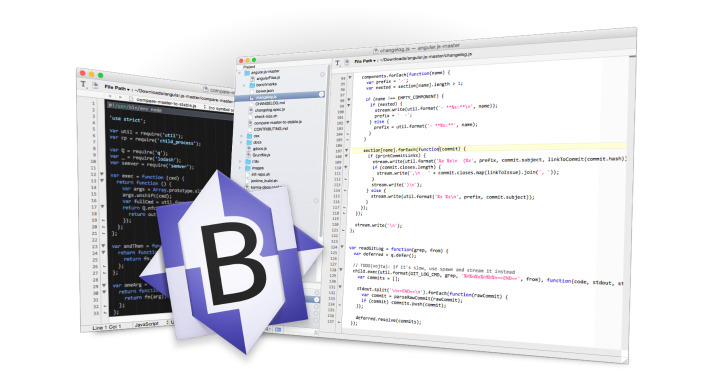 What’s new in BBEdit 12? Improved darktheme support When using a dark color scheme, BBEdit now colors editing and project window chrome to match, for a more integrated overall appearance. (For customers used to the old behavior, this can be set in the “Appearance” preferences.) For customers who have never before used BBEdit or TextWrangler, the “BBEdit Dark” color scheme is now the factory default; this can be changed if desired in the “Text Colors” preferences. Improved platform behavior Thanks to extensive internal overhaul, BBEdit now supports intrinsic OS behaviors such as Split View (and many others). Improved UI for FTP/SFTP Browsers, Text Factory, and Preview windows many nonediting windows have been overhauled for improved appearance and behavior, and to add features. New “Canonize” tool Provides a textbased model for batch search and replace, either within a single file or (by using a Text Factory) in multiple files. New “Columns” Editing Commands Easily cut, copy, delete, or rearrange columns in delimited (CSV, TSV) text files without requiring a spreadsheet or complicated regular expressions. Text Extraction This powerful addition to BBEdit’s legendary searching capabilities allows you to locate and collect search results into a single text document. Extraction can be run on the active text document, or across multiple files and folders. Use of Grep replacement patterns during extraction enables transformations to the extracted text.